I'll just come right out and say it: I am addicted to internal hubs. I love trying different gearing solutions, but with all my personal trikes I always end up with the Schlumpf High Speed Drive on the front. 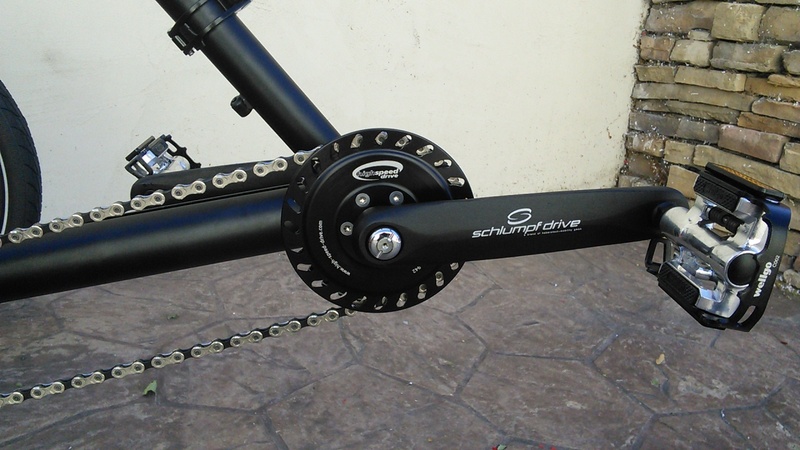 As mentioned in my Ultimate Gearing Article, the Schlumpf HSD is one way to solve the 20-inch wheel gearing issue. Hands down, the high speed drive is my personal favorite top-gear component. Besides just giving you higher gearing, it provides a very elegant solution that eliminates the standard front derailleur and improves the chainline. Another big advantage of the high speed drive is that you can shift at anytime, stopped or coasting, so you�ll never get stuck in too high of a gear. 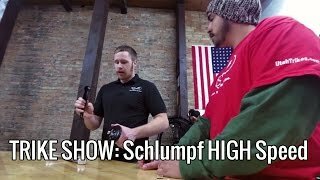 What is a Schlumpf drive? Unless you are familiar with small-wheeled recumbents, or perhaps unicycles, you've probably never heard of a Schlumpf drive. Schlumpf is a company out of Switzerland that specializes in internal hubs. 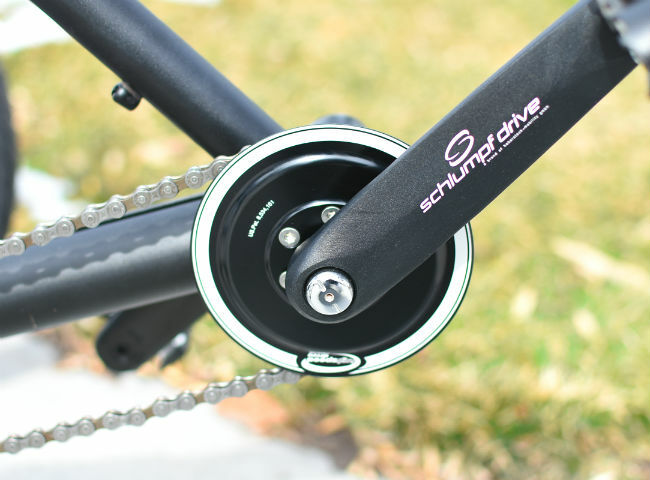 Unlike traditional internal hubs, the various Schlumpf drives all replace the standard bottom bracket (chainrings and cranks) and work in the front instead of the rear. The Schlumpf High Speed Drive is an internal gearing solution that uses planetary gears to increase the rotational speed of the chainring compared to the crank arms by 250% when engaged. When disengaged, the cranks are effectively locked to the 27-tooth sprocket. With such a wide gear range, the HSD completely replaces the front chainrings, derailleur, and shifter, even though it only has two gears. The wide gear range means virtually no overlapping of the gear ratios. Awesome gear range - With only a 27-tooth sprocket, the HSD gives us the equivalent gear as a 67.5-tooth chainring when the overdrive is engaged (27x250%). Since finding a chainring with more than 56 teeth is difficult, the HSD fulfills the need for higher top speed without sacrificing the low end. Using the standard 9-speed cassette found on many of our TerraTrikes (11-32) in combination with the HSD gives us a gear inch range of 17 to 123, compared to the stock gearing of 18 to 96. On our 8-speed trikes equipped with a 34-tooth low sprocket our low-speed gearing is 16. With this kind of gear range it is doubtful that you'll ever find a hill you can't climb, and yet you'll still be able to pedal at well over 30mph. Eliminate the front derailleur � Front derailleurs can be more finicky than rear derailleurs and aren�t typically as precise. Some gear combinations might even cause cross chaining. The Schlumpf HSD completely eliminates the need for the front derailleur, shifter and triple chainrings. This means you don�t have to worry about the chain moving (or not) from one chainring to another. The integrated chain guards make sure the chain stays on the HSD and won�t come off. Nice chainline � One of the questions I often get from potential trike customers is if the chain ever rubs on the leg or pants. Being in the recumbent position with your legs in front of you means the chain runs more parallel to your calf than on an upright bike. The stock TerraTrike idler position pulls the chain down under the front crossmember to help pull the chain away from the leg. Using the largest chainring still causes a fairly steep chain angle though. This increases the force on the idler as well as makes the chain run higher. Since the chainring on the Schlumpf HSD is so small (only 27-teeth), and never gets bigger, the chain always stays in the same position - nearly parallel to the boom. Installation of the High Speed Drive requires some preparation to the Bottom Bracket with specialized tools. Particularly, the HSD has conical plates that require the Bottom Bracket to be chamfered at a 45-degree angle on each side. 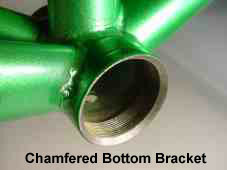 Chamfering the BB requires a special milling tool and special care to ensure a precise fit. 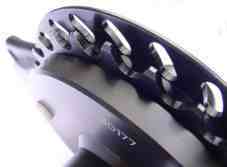 Once the BB is prepared the HSD is held in place by the shear clamping force of the locking bolt. Schlumpf recommends at least 150 ft/lbs, which is as high as many torque wrenches go. Once tightened, the crank arm and shifting buttons get put on. Then you're ready to go. If you ever decide to remove the Schlumpf HSD, the chamfering does not damage the BB, so stock gearing can be replaced. Planetary Gears - The main criticism that I ever hear about the Schlumpf drives are the stated efficiency of the drives. According to the latest test the planetary gears are rated at 95-97% efficiency when compared to a chainring. In other words, a 68-tooth chainring would be 3-5% more efficient than the Schlumpf in overdrive. What does this mean? Well, it means that if you could actually find a 68-tooth sprocket and had it on your trike instead of the Schlumpf HSD, you might be able to go a little bit faster. Improved chainline � I already mentioned the chainline above, but in terms of efficiency I propose the suggestion that the straighter the chainline the more efficient it is. My own testing of this prompted the creation of our High Performance Idler Kit. The Schlumpf HSD promotes a nice chain angle and exerts much less force on the idler. The sideways force on the idler (and the bending of the chain) is considerably less, which is where most of the efficiency is picked up. Improved shifting � I�ve never seen testing on this, but how efficient is the front derailleur and shifter as a unit compared to the Schlumpf�s button? Well, I�m not sure, but pressing a button is really easy and the chain doesn�t have to slide over. 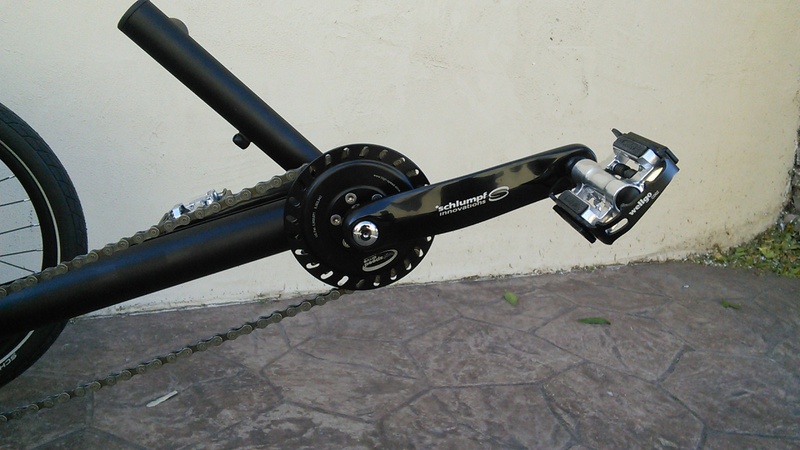 Without cranks, the HSD weighs 900g. The stock 170mm cranks weigh 180g. This is heavier than some setups, but when we compare the weight to the package of components it replaces, we've found that it's not that much of a difference. I ride with the HSD overdrive engaged probably 90% of the time. My lowest gear without downshifting the HSD is about 42 gear inches, which I find to be low enough to handle during the stop and go of my regular commute. Should I ever have to make a sudden stop, or forget to downshift, I always have a bail-out gear by just clicking the shift button. Hills are great with the HSD. Even steep hills are easy to climb with a 27-tooth chainring up front. And of course going down hills is a blast. All my own speed records have been set on Schlumpf HSD-equipped trikes. Downshifting between the two gears while in motion takes a little practice to do without breaking your cadence. Because there are no overlapping gears and the 250% ratio is so high it is necessary to up shift 5-6 gears in the rear while simultaneously downshifting the HSD. This is very easy to do with an internal hub (like the Nexus 8) in the rear, but is a little tougher to master with a standard rear derailleur. Take a test ride � We always have multiple trike models on the showroom floor equipped with the Schlumpf HSD, so you can come and see for yourself. One of our favorite setups combines the Schlumpf HSD with the Nexus 8 hub. Keeping your HSD running in top condition is easy. 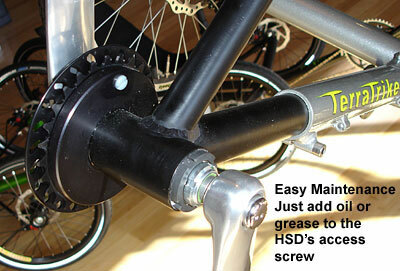 The HSD requires very little maintenance and is very easy. According to Schlumpf, the HSD only needs to be lubed once or twice a year with the included grease. They aren�t too picky though. In cold weather I like to put a few drops of motor oil and some heavier grease in the summer. I put a lot of miles on my trikes, so I typically add a few drops of lubrication every 4-6 weeks. Besides the much higher top gear and the super low gear, the thing I like the most about the Schlumpf HSD is the simplicity it adds to my trike. Sure, the HSD is not a �simple� piece of equipment, but it keeps the complex stuff hidden. Not having a front derailleur is something I really like, and it�s fun telling people I shift with my feet. Another cool feature of the HSD is that it uses square tapered crank shafts on both sides which makes it easy to try different crank arm lengths. I personally like the Schlumpf 152mm cranks for faster RPMs. Oh yeah, did I mention it has a 5-year warranty? For the ultimate in gearing solutions, we like to combine the Schlumpf HSD with internal hubs in the rear. This provides a super easy-to-shift system that is perfect for triking in mud, water, and snow. We have tested the Schlumpf HSD with the Shimano Nexus 8, Nuvinci CVP, and Rohloff SpeedHub. Note that the high torque of the 27-tooth chainring voids the Rohloff warranty, so you do this at your own risk. Under special circumstances we can fit the HSD with a 34-tooth chainring which brings it closer to Rohloff�s minimum requirement of 36 teeth. At Utah Trikes we love the Schlumpf HSD and always keep them in stock. You can have the HSD installed at the time you order your trike, or we can install it later. If you are a local customer, just bring your trike in and we can install it in about 30-45 minutes. For our long-distance customers, the easiest way to get the Schlumpf on your trike is to ship us your boom. If you have access to a chamfer mill, or your LBS does, we can ship you the drive with installation instructions. When you purchase the HSD from Utah Trikes installation is free.